Accuweigh has recently launched the Road Guardian axle weigh pads that employ advanced weighing technology for improved truck wheel weighing accuracy. 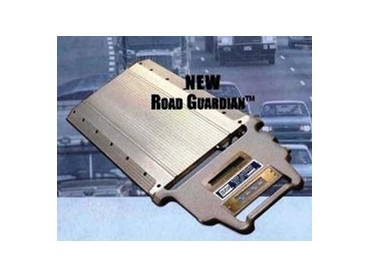 Road Guardian axle weigh pads ensure that vehicle axle loadings comply with legal weight limits. Under the Chain of Responsibility legislation, each and every person and company even remotely involved in the loading and transportation process can be held partly responsible and incur heavy fines in the event of overloading. Designed to check vehicle axle loadings cost-effectively, the self-contained axle weigh pads feature a low height profile of only 32mm to allow for easy truck access while minimising potential weighing errors caused by out of level wheels. Road Guardian axle weigh pads are manufactured from aluminium for strength and corrosion resistance with each axle weigh pad weighing only 15kg to allow them to be easily manoeuvred into position with minimal effort. Each axle weigh pad is fitted with its own integrated weighing indicator that is fully integrated into the carry handle and is powered by six AA-size batteries located in the display housing for full portability. The digital indicator allows the operator to display the weight of each individual axle weigh pad or the combined weight of all weigh pads. All new digital electronics provide a fast, accurate and easy-to-read weigh indicator that can be recharged from any 12VDC source or a VAC plugpack. The weight of each wheel is displayed on an easy-to-read alphanumeric LCD backlit screen that allows use even in low light or night-time operation. The Road Guardian axle weigh pads are available in 1, 2, 4 and 6 platform systems to accommodate a variety of different weighing configurations and can be expanded to interconnect up to 16 platforms in a single weighing system. The junction box allows up to six platforms to be interconnected for combined weight reading ability and for recharging the internal batteries of axle weigh pads at the same time. Accuweigh is a leading Australian industrial weighing equipment company, operating eight branches across Australia to provide complete service support on axle weigh pads, weighbridges, scales and weighing equipment.